GitHub - OpenDroneMap/WebODM: 📷 ✈ User-friendly, extendable application and API for processing aerial imagery. Want to be notified of new releases in OpenDroneMap/WebODM? 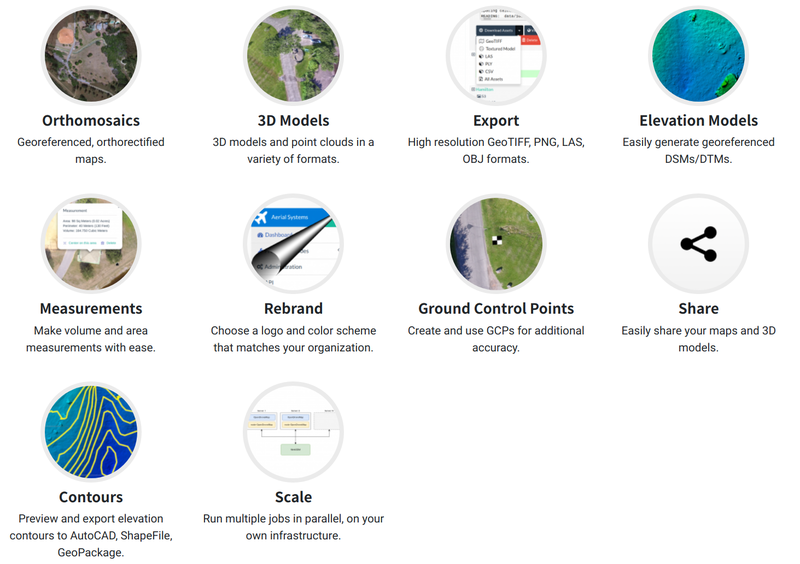 A user-friendly, extendable application and API for drone image processing. Generate georeferenced maps, point clouds, elevation models and textured 3D models from aerial images. It uses ODM for processing. Windows users have a choice between Docker Toolbox (Windows 10 Home or older) and Docker for Windows (Windows 10 Pro or newer). Docker for Windows users should set up their Docker environment before launching WebODM using the Docker utility in the system tray: 1) make sure Linux containers are enabled (Switch to Linux Containers...), 2) give Docker enough CPUs (default 2) and RAM (>4Gb, 16Gb better but leave some for Windows) by going to Settings -- Advanced, and 3) select where on your hard drive you want virtual hard drives to reside (Settings -- Advanced -- Images & Volumes). The address to connect to would then be: http://192.168.1.100:8000. We recommend that you read the Docker Documentation to familiarize with the application lifecycle, setup and teardown, or for more advanced uses. Look at the contents of the webodm.sh script to understand what commands are used to launch WebODM. For Windows and macOS users an installer is also available. You can also run WebODM from a Live USB/DVD. See LiveODM. WebODM can be linked to one or more processing nodes running NodeODM. The default configuration already includes a "node-odm-1" processing node which runs on the same machine as WebODM, just to help you get started. As you become more familiar with WebODM, you might want to install processing nodes on separate machines. Adding more processing nodes will allow you to run multiple jobs in parallel. You will not be able to distribute a single job across multiple processing nodes. We are actively working to bring this feature to reality, but we're not there yet. Then from the web interface simply manually remove the "node-odm-1" node. WebODM has the ability to automatically request and install a SSL certificate via Let’s Encrypt, or you can manually specify your own key/certificate pair. Setup your DNS record (webodm.myorg.com --> IP of server). Make sure port 80 and 443 are open. That's it! The certificate will automatically renew when needed. If you want to specify your own key/certificate pair, simply pass the --ssl-key and --ssl-cert option to ./webodm.sh. See ./webodm.sh --help for more information. Note that existing task results will not be available after the change. Refer to the Migrate Data Volumes section of the Docker documentation for information on migrating existing task results. While starting WebODM you get: 'WaitNamedPipe','The system cannot find the file specified.' 1. Make sure you have enabled VT-x virtualization in the BIOS. Task fails with Process exited with code null, no task console output - OR - console output shows Illegal Instruction - OR - console output shows Child returned 132 If the computer running NodeODM is using an old or 32bit CPU, you need to compile OpenDroneMap from sources and setup NodeODM natively. You cannot use docker. Docker images work with CPUs with 64-bit extensions, MMX, SSE, SSE2, SSE3, SSSE3, SSE4.1, SSE4.2 and POPCNT instruction set support or higher. While running WebODM with Docker Toolbox (VirtualBox) you cannot access WebODM from another computer in the same network. As Administrator, run cmd.exe and then type "C:\Program Files\Oracle\VirtualBox\VBoxManage.exe" controlvm "default" natpf1 "rule-name,tcp,,8000,,8000"
Have you had other issues? Please report them so that we can include them in this document. If you want to move WebODM to another system, you just need to transfer the docker volumes (unless you are storing your files on the file system). docker run --rm --volume webodm_dbdata:/temp --volume `pwd`/backup:/backup ubuntu bash -c "rm -fr /temp/* && tar xvf /backup/dbdata.tar"
docker run --rm --volume webodm_appmedia:/temp --volume `pwd`/backup:/backup ubuntu bash -c "rm -fr /temp/* && tar xvf /backup/appmedia.tar"
The password will be reset to newpass. The command will also tell you what username you chose. Plugins can be enabled and disabled from the user interface. Simply go to Administration -- Plugins. Don't expect to process more than a few hundred images with these specifications. To process larger datasets, add more RAM linearly to the number of images you want to process. A CPU with more cores will speed up processing, but can increase memory usage. GPU acceleration is still a work in progress, so currently a good video card does not improve performance. WebODM runs best on Linux, but works well on Windows and Mac too. If you are technically inclined, you can get WebODM to run natively on all three platforms and there's a native installer for Ubuntu 16.04 also available. NodeODM and ODM cannot run natively on Mac and Windows and this is the reason we mostly recommend people to use docker. WebODM by itself is just a user interface (see below) and does not require many resources. WebODM can be loaded on a machine with just 1 or 2 GB of RAM and work fine without NodeODM. You can then use a processing service such as the lightning network or run NodeODM on a separate, more powerful machine. The plugin system is still in beta. The best source of documentation currently is to look at existing code. If a particular hook / entrypoint for your plugin does not yet exist, request it. We are adding hooks and entrypoints as we go. To create a plugin simply copy the plugins/test plugin into a new directory (for example, plugins/myplugin), then modify manifest.json, plugin.py and issue a ./webodm.sh restart. The OpenDroneMap project is composed of several components. ODM is a command line toolkit that processes aerial images. Users comfortable with the command line are probably OK using this component alone. NodeODM is a lightweight interface and API (Application Program Interface) built directly on top of ODM. Users not comfortable with the command line can use this interface to process aerial images and developers can use the API to build applications. Features such as user authentication, map displays, etc. are not provided. WebODM adds more features such as user authentication, map displays, 3D displays, a higher level API and the ability to orchestrate multiple processing nodes (run jobs in parallel). Processing nodes are simply servers running NodeODM. We follow a bottom-up approach to decide what new features are added to WebODM. User feedback guides us in the decision making process and we collect such feedback via improvement requests. Don't see a feature that you want? Open a feature request or help us build it. Sometimes we also prioritize work that has received financial backing. If your organization is in the position to financially support the development of a particular feature, get in touch and we'll make it happen. We also have a Gitter Chat, but the preferred way to communicate is via the OpenDroneMap Community Forum. Help us test new and existing features and report bugs and feedback. Help answer questions on the community forum and chat. Spread the word about WebODM and OpenDroneMap on social media. While we don't accept donations, you can purchase an installer or a premium support package. The easiest way to get started is to take a look at our list of outstanding issues and pick one. You can also fix/improve something entirely new based on your experience with WebODM. All ideas are considered and people of all skill levels are welcome to contribute. You don't necessarily need to be a developer to become a contributor. We can use your help to write better documentation and improve the user interface texts and visuals. To make a contribution, you will need to open a pull request (here's how). To make changes to WebODM, make a clone of the repository and run ./webodm.sh start --dev. If you have questions visit us on the forum and we'll be happy to help you out with your first contribution. WebODM is built with scalability and performance in mind. While the default setup places all databases and applications on the same machine, users can separate its components for increased performance (ex. place a Celery worker on a separate machine for running background tasks). 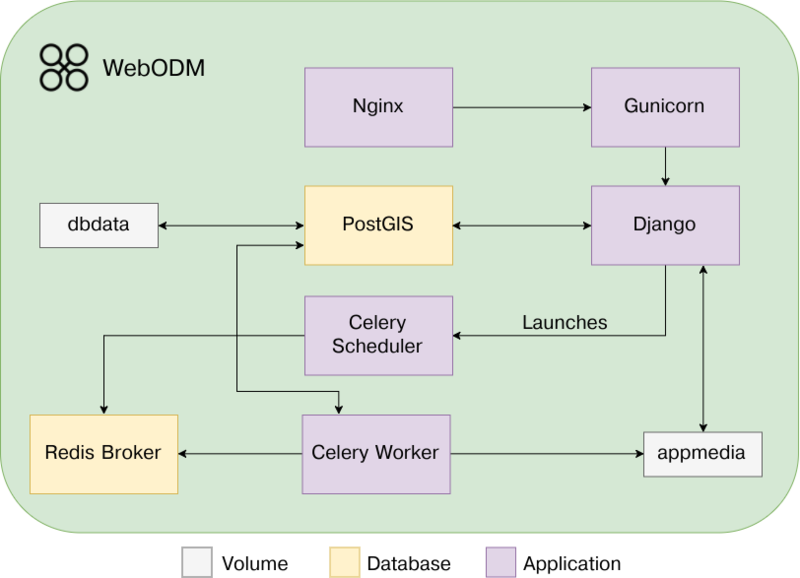 We use Celery workers to do background tasks such as resizing images and processing task results, but we use an ad-hoc scheduling mechanism to communicate with NodeODM (which processes the orthophotos, 3D models, etc.). The choice to use two separate systems for task scheduling is due to the flexibility that an ad-hoc mechanism gives us for certain operations (capture task output, persistent data and ability to restart tasks mid-way, communication via REST calls, etc.). If you wish to run the docker version with auto start/monitoring/stop, etc, as a systemd style Linux Service, a systemd unit file is included in the service folder of the repo. This should work on any Linux OS capable of running WebODM, and using a SystemD based service daemon (such as Ubuntu 16.04 server for example). This has only been tested on Ubuntu 16.04 server. WebODM can run natively on Windows, MacOS and Linux. Ubuntu 16.04 LTS users can refer to this community script to install WebODM natively on a new machine. A commercial installer with technical support is also available. The start.sh script will use Django's built-in server if you pass the --no-gunicorn parameter. This is good for testing, but bad for production. In production, if you have nginx installed, modify the configuration file in nginx/nginx.conf to match your system's configuration and just run start.sh without parameters. Should all work without errors. 12 steps, to have WebODM running on a cloud instance. Launch a Google Cloud instance of Ubuntu 18.0 LTS. Open the SSH terminal - Google offers SSH via the website. You now can access webodm via the public IP address for your google instance. Remember the default port of 8000. Check that your instance's firewall is allowing inbound TCP connections on port 8000! If you forget this step you will not be able to connect to WebODM. To setup the firewall on Google Cloud, open the instance, on the middle of the instance settings page find NIC0. Open it, and then add the TCP Port 8000 for ingress, and egress on the Firewall.